This month was the month for short commercials. Leaving us hooked for wanting to watch it on repeat were some of these amazing tv commercials that went onto making it to the top 10 with Asian Paints at the first spot. The former couple Ranbir Kapoor and Deepika Padukone recently joined hands for a television commercial featuring Asian Paints Royale’s Anti Bacterial Paint which to mention is also the first of its kind and recommended by the Indian Medical Association. The commercial successfully managed to steal the hearts of all with its playful idea and tone making it the most viewed advertisement in March. Samsung’s commercial for its new release which is an action-packed smartphone with a triple camera set up that gives users 123-degree ultra wide angle for videos managed to gather over 41 million views with 52k likes only on Youtube. Keeping in mind the target audience the commercial showed millennials exploring and having fun with the smartphone making it the second most viewed commercial in March. Getting everyone excited was Samsung’s commercial that features it’s new range of smartphone Samsung Galaxy S10 that takes us for a dive into the world of technology and amazing features the product offers. With more than 30 million views, it is the third most viewed advertisement for the month of March. As a part of its women’s day campaign #MaxWomenFest, Max released this commercial that not only shows its wide range of fashion apparel but also sends out a social message with its trending hashtag #BehenKuchBhiPehen to all the women to dress how they want and feel beautiful about themselves. 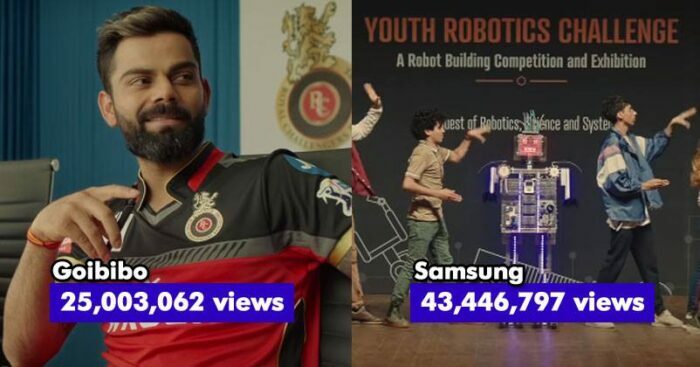 The well-thought advertisement is surely impactful and has managed to capture the hearts and minds of many making it the 4th most viewed advertisement of March with more than 29 million views. This commercial proved to be a treat to all bike lovers as Bajaj comes up with the latest addition to India’s most iconic bike range- Pulsar 150. Being the numero uno sports bike of the country for the past 17 years, the 2019 edition is inspired by the bright neon TRAIls of the highways donning a matte black finish which will be available in three color designs: Neon Red, Neon Yellow and Neon Silver sticking to the mechanism of Pulsar Classic 150. The ad successfully generated above 28 million views and made it to the list of top 5 commercials of the month. Garnier’s new commercial for its Micellar Oil-Infused Cleansing Water is a pop of colors which was just in time with the festival of the season- Holi. The product claims to remove 96% of your stubborn makeup in just one go. The short, funky and colorful commercial got over 24 million views making it the sixth most viewed ad in the month of March. Samsung has highlighted its latest Galaxy A series devices: A10, A30, and A50 in this commercial that has some cool and amazing features like 123-degree Ultra-wide Lens to capture ultra-wide videos and in-display fingerprint sensor. The shortest tv commercial in the lot got about 21.4 million views making it the seventh most viewed ad in the month of March. For the love of high-quality pictures, Oppo launched its F11 Pro that has 48 MP dual rear camera set up and a panoramic screen allowing you to capture brilliant portraits in low lights. The commercial shows the struggles of taking the perfect picture in a humorous way leaving us all hitched to this ad. 9. Goibibo Travel: KKR Cricket Match! With the IPL fever running Goibibo’s travel cash fest makes a comeback. The commercial which is a collaboration with IPL teams RCB and KKR shows cricketers and celebrities like SRK, Deepika Padukone, Virat Kohli and others where Deepika is guiding on how to score big during the matches. So, in case you are in a mood to travel around remember with every hit by RCB and KKR you can get travel cash that can be used to book flights, hotels, etc through Goibibo pocket-friendly. Who can forget the iconic duo Ramesh-Suresh that got us rolling on the floor laughing The commercial is a collaboration of 5 star and Amazon pay that was rolled out with the hashtag #5StarPeAmazonPay shows the pair lost as they munch away their bar of happiness. The commercial was showered with love and managed to get over 18 million views securing its place in the top 10 most viewed ads of March 2019. While we eagerly await the list of April, this month has surely got us hooked to our screens.